When you have a brand, run with it! The popular young adult book series “Percy Jackson & the Olympians” has seen life on the big screen, but now it's time for a turn on stage. Inspired by the book, the mythical world of Greek gods and modern teen hardships battle it out in The Lightning Thief. 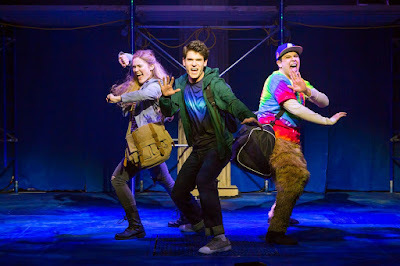 The Lightning Thief: The Percy Jackson Musicals, with a book by Joe Tracz and score by Rob Rokicki, is great for the demographic, honors the source material. But it can be much stronger. Percy Jackson isn't your average teen. Sure, he has dyslexia and ADHD, but he's also a half-blood. His mom is mortal, but his dad is a god. A "big three" god too. As he learns of his powers as monsters begin to attack, Percy goes on an epic quest to save the world from the feuding gods. With an energetic pop-rock score by Rob Rokicki and a text by Joe Tracz that heavily taps into the real world themes, The Lightning Thief has the potential for greatness. It just misses the mark at times. There is a lot of material to cover, so there's a lot left out to create the complete story on stage. If you're unfamiliar with the source material, the way some facts unfold becomes confusing. There is a good chunk of the score that can easily be lifted as stand alone songs. Even with thematically significant content, every three or four minute number that lacks plot causes a game of catch up in the libretto. Even if the show is directed for kids, eliminating the dramaturgical holes is essential. And it all starts with the opening number. If Percy doesn't know he's a half blood yet, how can he sing about it in the first song? It's not presented as a future moment in the story; It's the start of the narrative. Kids may not care or notice, but one blaring plot hole causes the others to become prominent. With an approach that explores real life problems, the accessibility invites kids to feel like they're not alone and boosts their morals while they get to go on an insane adventure with Percy and his friends. And that is what is so important about this musical and this series. It does take a heavy-handed turn at the end that is reflective of today. It may go over the kids' heads but it's there for the adults. The Percy Jackson property has a world open for creativity. What can be done on film cannot be done on stage. And for that, the pieces are singular. That being said, the magical world of The Lightning Thief was subpar. Director Stephen Brackett's vision didn't seem like what you'd expect for a Percy Jackson musical. It felt a little more like rejected production of Rent. This is a magical world. It’s our world but there is the element of the Greek gods. The things that can be created are boundless, and yet Lee Savage’s set felt like a waste. The scaffolding may work for a tour, but this sit down production needed more brilliance. It desired flash and pizzazz. It wasn’t there. The actual magic is small in this show, but it just highlights what a giant budget could bring. The costumes from Sydney Maresca did their job, but once again, when characters weren’t rooted in reality, something more was desired. That being said, the Deadmau5 inspired Cerberus head was exactly what this show needed. The colorful rock show vibe from lighting designer David Lander was visually pleasing and helped to create the many worlds of Percy’s quest. Chris McCarrell took on Percy Jackson with an angsty approach. He had a rocker grit in his voice that brought out Percy’s personality. McCarrell has a natural allure that kept the piece moving. Taking on Percy’s bestie Grover and camp warden Mr. D, George Salazar was a scene stealer. His ability to shift from the meek and trepidacious Grover to the boisterous and animated Mr. D was nothing short of seamless. Salazar was the unsung hero of the show. Kristin Stokes as Annabeth was quite understated. Simply by being surrounded by such big characters, Stokes fell into the background. Taking on the array of monsters, gods, and creatures of the world, Carrie Compere, Sarah Beth Pfeifer, Jonathan Raviv, and James Hayden Rodriguez took their moments in the spotlight and made the best of it. They were more than a support, they were the pulse of the production. The Lightning Thief is meant for the stage. And this production shows what it can be. Kids will love it. Parents will tolerate it. And in the end, it’s really up to the former.